This is a transcript of an article written in London on 8 May, 1917 and published the following day in the Australian daily newspaper The Age (1). When you will read it, you will notice (once again) that historical documents always confirm the official Israeli narrative and destroy the anti-Zionists’ propaganda. One says that Jews lived in perfect harmony with Muslims in Palestine before the restoration of a Jewish state in 1948. The other pretends that “colonization” and “occupation” are responsible for the conflict. But in 1917, there was no colonization, no occupation, no State of Israel, no occupied East Jerusalem, no blockade or apartheid, or any other nonsense manufactured and maintained with the active participation of the left and the media. Zionist organizations in New York have received advice from Palestine that the Turks are driving the Jews from their homes amid scenes of looting and pillage. Djemal Pasha*, minister of Marine, is reporter to have declared that he will make the Jews suffer the fate of the Armenians. Eight thousand Jews have been drivent from Jaffa. Some who resisted were hanged. Three hundred were expelled from Jerusalem. Many crawled towards the desert and died. The “Jewish Chronicle” published awful details of the desperate condition of the Jews in Palestine. 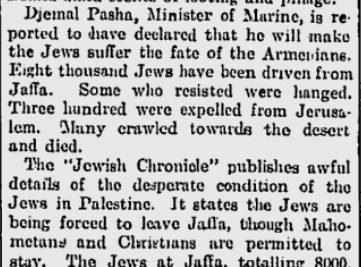 It states the Jews are being forced to leave Jaffa, though Mahometans and Christians are permitted to stay. The Jews of Jaffa, totaling 8000, have not been allowed to take away any of their belongings or food. The houses are looted even before the owners leave. The roads for Jaffa are lined with thousands of starving Jewish refugees. Many wealthy Jews were found dead on the sand hills, evidently victimes of robbery and murder. When the Jews organized bodyguards to watch the roads, the Turkish authorities immediately imprisoned the guards. * Ahmed Jemal [Djemal, Cemal] Pasha (1872-1922) was the overseer of the Armenian Genocide.